»Let's Head To Mandrem In Goa For An Intoxicating Travelling Experience! Let's Head To Mandrem In Goa For An Intoxicating Travelling Experience! Let us focus on one of the northernmost beaches in Goa which is Mandrem. It is 5.95 km away from the boundary of Goa and within Maharashtra. It merrily lies in between Arambol in the north and Ashwem Beach in the south. Heard about the Pernem region of Goa? The Mandrem beach is just 28.5 km northwards from Panaji, Goa's capital. Mandrem might be a small but is quite a wondrous beach. It is around 790 m long and is a white pristine beach full of sand but it is not as popular as the other beaches of Goa. Thus, you shall find its paths lonesome even during the peak seasons! Its shore is adorned with gigantic palm and casuarina trees. You can spot a few sand dunes with shrubbery all around it as well. The Mandrem village being a fishing community shall help you catch glimpses of certain scenes like fishing boats at times, fisherman counting how much of fish they catch hold of, as well as the locals can be seen drying off their nets on the soothing beach areas. How can we forget to mention the shacks which are controlled by the locals with their sun beds and they give you full liberty to sit back and relax while you chew on your food and gorge in the beauty of Nature as well. By Air: The airport within closest proximity is the Dabolim Airport, that is just 53 km from the Mandrem beach. The airlines which are functional from here are Indigo, Air India, Etihad, Air Arabia, Air Asia, Qatar Airways as well as Jet Airways. By Rail: Pernem should be the nearest railway station which is just 15.2 km away. And if you measure the distance of it from the Thivim railway station, it is only 20.6 km away. By Road: Goa is very well connected by road with the surrounding major states and cities. The best time to visit Mandrem is from November to February, as it is the peak tourist season in Goa. This is when the Mandrem beach shall feel the best. Very pleasant weather and the long and sunny days shall not hurt you. The rainfall is also quite less with extremely low humidity. You shall hit upon a soothing breeze in the evenings and even the beach shacks are quite welcoming. The restaurants and cafes shall not disappoint you at all, we can vouch for that! Take a look at these tourist attractions of Mandrem, and start packing your bags! Mandrem will take you in flashback season and remind you of the early Goa days when it was not so popular among tourists and traversed so frequently by them. 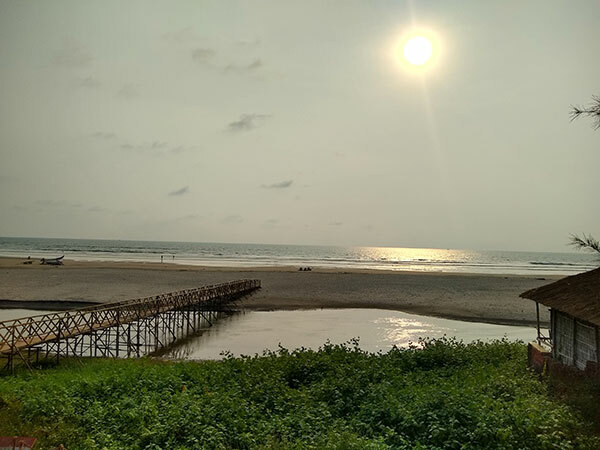 When you are in a party mood, then North Goa is like the best bet but when it comes to a rejuvenating weekend away from the daily monotonous lifestyle, then the serenity of Mandrem shall captivate your soul for sure! Take a dip into the water but take care! The Arabian Sea can give you a surprise at places by going deep. The mornings and evenings are quite comfy at Mandrem while the beach shall present you with one of the best sunsets ever! You can use a lot of bridges made of bamboo and wood for crossing the river. They are constructed by the locals in order to ease the journey for the travellers and you can ride your bike in those places as well. It is impossible for the vehicles to pass by as they are quite steep. You shall only come across hotels, guest houses and budget accommodation on the opposite side of the creek. Have you ever seen the tide just gliding into the river? It looks lovely. It fills up during high tide and again goes downslope during low tide. The rippling water when the wind sweeps over the calming water is a spectacular scene to see. You shall find the imprint of Nature all around this place. Be it eye-catching casuarina trees or the perfect palm trees, you can spot all kinds of construction works nearby, a lot of tourist activities as well as water sports to make your holiday a wonderfully relaxed one. When it comes to wildlife, say hello to the kingdom present here such as kingfishers, herons, white-bellied fish eagles as well as plenty of crabs which are more than the tourists and sunbathers any day! Nevertheless, if it's your lucky day: then you can spot Olive Ridley the endangered species of marine turtle, cradled in the beach area when it is rarely crowded. Do not try to get close to the turtles which lie in a protected manner. You shall not find a lot many shacks at Mandrem. But of course, the sunbeds with umbrellas on the beach are quite enchanting and rejuvenating to the soul. With the shacks being located at the riverfront, you can spot the sand on one side and the sea on the other. At times, you can sway your hips at the music being played in the shacks and groove at the numbers being played! The food available here is not very scrumptious but the 'End Of The World' cafe is quite a bright place for a happy meal. Their fish is worth a try and so is 'Oasis' for their prawns, tandoori chicken as well as a variety of bread. The beach is just at a two-minute walking distance from this riverfront restaurant called 'Molly's Nest'. 1) Swimming -The beach is nice and clean for a nice swim down there. There are guards for your safety as well. So, take a dip folks! 2) Yoga and Meditation Classes - Be it yoga, meditation or just an Ayurvedic massage! All these soul-soothing activities are possible on the soft sand by the sparkling beach and guess what? Teacher training courses for these activities is also available! 3) Feni - How can we not talk about the popular local alcoholic drink of Goa? Three cheers with your glass of Feni! 4) Markets And Sunsets - You will have to catch hold of a scooter to traverse the market areas of Madlamaz-Mandrem. The market areas will surprise you with a lot of goodies like food items and drinks as well. Watching the skies turn crimson over the Arabian Sea during the mesmerizing sunset is a definite treat to the eyes!